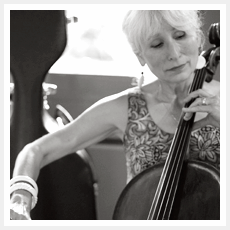 Cellist Linda Mehrabian began her professional career as a cellist at the age of sixteen as the youngest member of the San Diego Symphony and remained a member of that orchestra for the subsequent six years. Her distinguished series of mentors included Joseph Di Tullio, Milos Sadlo, Edgar Lustgarten, and Daniel Rothmuller. For fourteen years, Linda was an active Los Angeles studio musician, working on numerous movie scores and record albums. She also pursued a demanding career that included solo and chamber music performances and work with the Glendale Symphony. Linda has toured and soloed with many celebrities, including Burt Bachrach and Dinah Shore. She also has performed on recordings and live performances for Van Cliburn, Sammy Davis, Jr., Aretha Franklin, James Galloway, Olivia Newton John, Liberace, Ramsey Luis, Henry Mancini, Bette Midler, Luciano Pavarotti, Smokey Robinson, Frank Sinatra, The Spinners, Rod Stewart, Barbara Streisand, Dionne Warwick, John Williams, and many others. After moving to Monterey in 1989, Linda began to participate in chamber and symphonic performances of the Mozart in Monterey Festival. Since 1992, she has served as a regularly performing member of the Monterey County Symphony Orchestra. Linda and her musician colleagues are called on frequently to perform at weddings, parties, and corporate events in Monterey and surrounding counties.